As was mentioned earlier, Studio1 will allow the user to run multiple instances of the software. Each instance can be configured for a different SDR receiver that may be connected to your system. For example if you have a VHF/UHF SDR radio and separate HF SDR radio you run them simultaneously using Studio1. For example you could have the VHF/UHF SDR listening for activity on the local ham radio repeater while using the HF SDR radio to listen to 20Meter SSB broadcasts. Each SDR radio connected can have it’s own set of multiple VRXs, SP1s, SP2s, and RX Controls.How many external radios can you have? Well, thats going to depend on how much CPU power you have available and your ability to physically connect the radios. However, using a couple of SDRs connected shouldn’t pose much of a problem for most CPUs since Studio1 is fairly efficient when it comes to CPU usage. This is an area that Studio1 stands heads and shoulders above the other software offerings. To be able to fully appreciate this, you must have a fairly decent audio chain attached to your computer. At HRS the main SDR lab testbed computer is equipped with a Focusrite Scarlet 2i2 connected to a pair of KRK Rockit 5 studio monitors for audio output. This gives the ability to more critically evaluate audio quality than typical PC speakers. If you are using cheap computer speakers or your laptop speakers, you are missing out on a large part of what SDR can offer. You might want to consider investing in a nicer set of computer speakers or at least a good set of headphones. With that being said, the Studio1 DSP engine is a stellar audio performer. The other SDR programs just sound kind of tinny in comparison. Listing to Studio1, you will notice one thing right away the low noise floor. You won’t hear much unnecessary hiss with this DSP engine. 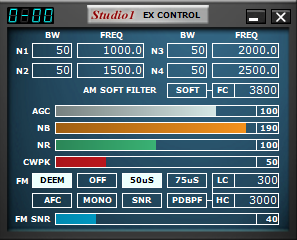 Another standout in Studio1 is its FM Stereo decoder featuring a proprietary SNR (Stereo Noise Reduction) algorithm. The audio quality from the FM stereo decoder is superb! The audio from the FM Stereo Decoder is very comparable with studio grade FM monitors that some of you may have come across in the past. AM is not slouch either. Studio1 utilizes an AM “soft filter” that warms up the audio. The audio from the AM decoder is very reminiscent of a tube based amplifier and is very pleasant to listen to. Of course with all the filters and other adjustments you can make to the audio SSB and CW also sound excellent. Needless to say is how well Studio1 works depends ultimately on the quality of the SDR hardware you are using. 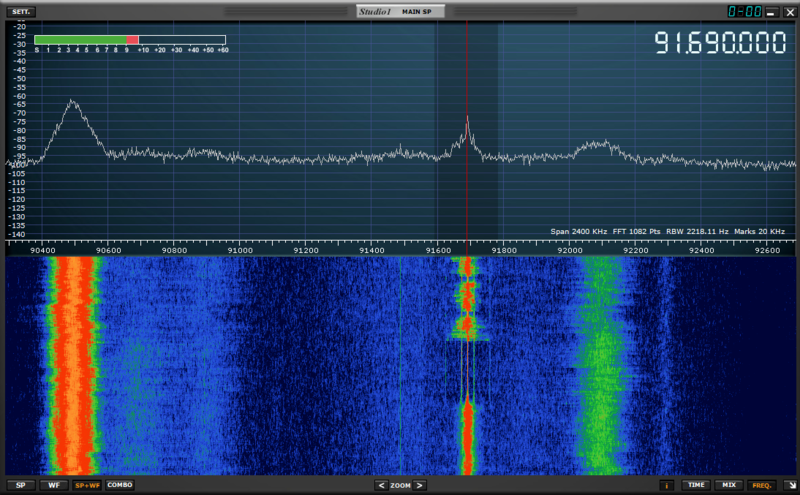 Given that, I decided to take a look at how well Studio1 worked with some of the “not so higher end” SDR radios. I took a look at the lowly $20 RTL2832U and came away highly impressed with what Studio1 could do with the RTL2832U DVB-T stick. I simply dropped this 3rd party ExtIO.dll into the Studio1 folder and was good to go. FM Stereo form the RTL2832U was superb. The audio quality was excellent and the stereo separation was quite impressive. The RDS feature also worked well. UHF / VHF public service frequencies also came through very nicely in Narrow FM mode. So if you own a high end SDR HF rig and Studio1 and you might want to consider adding a RTL2832U for FM Stereo and VHF / UHF reception. I also tried out using the RTL2832U along with the Ham It Up converter for HF reception. Again Studio1 came through and allowed for a very enjoyable HF listening experience using this cheap combination. Of course the RTL2832U / Ham It Up HF converter performance can’t be compared to a high end HF SDR, but it works very well for the investment. Again, even if you already are using a high end HF SDR radio with Studio1, you might want to consider picking up the low cost (Less than $75) RTL2832U / Ham it Up combo as a second HF radio. The only slight problem we ran into was the ExtIO was not %100 compatible with Studio1 in that we couldn’t change the sample rate or select multiple RTLs through the ExtIO.dll. However the good news was that the sample rate was set by default at 2.4MHz giving a pretty wide bandwidth to work with, plus the all important RTL gain settings were workable. Hopefully, this will get sorted out at a future date by the Studio1 developer or the ExtIO.dll developer. However, it doesn’t prevent Studio1 from working perfectly well with a single RTL2832U dongle. Studio 1 is an admirable attempt at SDR control, however its author needs to be able to accept constructive comment rather the ban its paying users from the forum. I feel that there should be a critical comparison between the various pieces of software out there. Studio1 is only one of the many and varied programs and considering the price tag I feel SDR-Radio v2 has the potential to leave Studio1 users wanting. Anyone reading this review should consider trying other software before commuting the large tag to Studio1’s average offering. I for one will not be purchasing the next version as I felt insulted by the way I was treated with this software author. Free and friendly over costly and caustic any day! My dealings with the Studio1 developer were generally very positive. Like a lot of developers, the Studio1 developer is very passionate about his work. Which I feel is a “good thing”. As far as the other SDR software offerings go, they all bring something to the table. Hobbyist just starting off in SDR radio should definitely take a look at the free offerings to get some experience. Having used all the other SDR software offerings over the years, I can say Studio1 definitely offers a step up for the more demanding SDR user. I don’t think you will see an accurate head to head comparison between SDR programs anytime soon simply because there are way too many variables when it comes software, computers systems, SDR hardware, sound cards, etc. I agree with the comments about Studio 1’s author. He treats his customers with rudeness and disrespect. I advise everyone to use HDSDR instead since it is free, performs better than Studio 1, and does not have all the unhappy users that Studio 1 has. If you make any kind of criticism of Studio 1 on the Yahoo group, you will be banned. This is no way to treat customers who have paid a lot of money for Studio 1. I wonder how much of the positives in this review were influenced by you guys getting a free copy of Studio 1? If you read the Studio 1 Yahoo group, there are a lot of unhappy users. Your review did not point out any of the negatives of this software, hence, I suspect you got a free copy of Studio 1 in exchange for a good review. Nope, we didn’t get a free copy. When we decide to review a product, if there is a discussion community for it, we spend some time reading the topics. When, Studio1 was first released like virtually all new software, there were some issues and there were some unhappy users. Since then, most of those issues have been resolved. There seems to be far more happy users now. I guess we are not looking at the same discussion group because there are still many unhappy customers on the Studio1 Yahoo group. There would be even more, but when anyone speaks out, complainers get banned. I don’t think you have done enough homework in researching user satisfaction with Studio 1. You also have stated that Studio 1 has a new ‘DSP Engine’, but Studio 1 is based on WinRad and uses WinRad’s “DSP Engine” which has been around for many years. In fact it is the same code as used in HPSDR and other programs. Studio 1 was free and was called WRPLUS – which was just another variant of the original WinRad. The reason why it will run on older CPUs is because Winrad was developed years ago when those older CPUs were new CPUs. This tells me that you do not really know what you are talking about in your reviews. No sir, if there is a misinformed person here that person is you and I can prove it: in the past I took the code of Winrad (as I liked that program very much) then I started to heavily modify it improving its performances so WRplus was born. Then I rewrote completely WRplus and the result is Studio 1. The proof? Take Studio 1 and compare the performances against Winrad and HDSDR, do also some real measurements of signals; try the countless new features NOT INCLUDED in the original program. I have compared the performance and HPSDR, which is free, performs as well or better than Studio 1. If you would listen to your unhappy customers instead of banning them from your support group, maybe you’d understand why there are so many negative comments about Studio 1. Then sir you are a liar. You don’t own a copy of Studio 1. Also, “Jonas Husted” is a fake name because you are worried to let us know your real name. We never had a customer with that name nor a member of the Studio 1 group. See this is the typical response that you will get from the Studio 1 author! He has nothing but disdain for his customers. I purchased Studio 1 and the USB dongle from another customer who was selling it at half the price he paid for it. I did not purchase it new from you. I am currently subscribed to your Yahoo group too. If you want proof the latest message on the group as I type this response is titled “S Meter”. Since Studio 1 was not what I wanted either and had various bugs, I have now also sold my copy of Studio 1 and the USB dongle. I can tell you I will NEVER purchase ANYTHING from you given your poor attitude! Jonas, instead of hiding behind a fake name, reveal yourself, tell the nickname you used to join the Studio 1 group and talk about actual facts: you are pathetic! Don’t you realize that your credibility is 0 in this way? Show us the results of your tests instead of babbling. Say what you want if it makes you feel better: smart people know where the truth is. Sandro you can forget it! You want to know my Yahoo name so you can ban me from your Yahoo group like you have so many others. If I am making up problems with you and your product, why is there other people leaving comments that have had the same bad experience as me with your products? You have made so many unhappy customers with your poor treatment of customers. That is entirely your fault! I know that you will not allow these comments onto your comment section of the review. Just like the manufacturer’s you criticize for not sending you free stuff to review, you will not take any criticism either. If you were running an honest website, you would allow these criticisms and comments on the errors in your reviews. Actually HRS welcomes comments on the articles published here. It’s just that we try to maintain a “family friendly site” as much as possible. Due to the large amount of comment spam, we have to “moderate” new comments. Because of that, sometimes comments take several hours to show up. However, we do prefer more vigorous discussions take place in our forums. We were not criticizing vendors at all that are reluctant to have us do a review on a product nor implying anything. We were just explaining that we may not be able to do a review on a requested product since HRS is not as well known as some of the big guys (but we are growing!). I am impressed that you have actually let my critical comments be posted on your website instead of removing them. I retract my comments about giving good reviews to free stuff. Now if Sandro, the author of Studio 1, was so open to criticism maybe he would not have so many unhappy customers. As it is, he treats anyone who makes a complaint or bug report about Studio 1 as an enemy. In fact, Sandro is his own worst enemy. Do check out other software such as SDR radio V2 before you part with your cash .. When the Winradios are supported (Already on HDSDR etc.) I will look again, at the moment it does not offer me anything new. I can run multiple instances of other software etc. As there is no demo available I can not make a direct comparison. I would also like to see a head to head test of say Studio 1, HDSDR, SDR# and SDR RADIO V2 . Software is very important to SDR. However there seem to be more unhappy Studio 1 customers than happy ones, I have not heard any one say they would buy again? There are a lot of free SDR applications that perform as well or better than Studio 1. I recomment HDSDR over Studio 1. Unfortunately, Sandro distrusts his potential customers so much that he refuses to provide a demo version of Studio 1 so that people can actually make a comparison before spending a lot of money on his product. Ham Radio Science needs to review the many other excellent FREE SDR software out there before proclaiming that Studio 1 is the best user interface. During A B testing with other SDR programs using studio monitors, there was absolutely no question that Studio1 out performed the other available software in regards to audio quality and a low noise floor. Plus the quality of and flexibility of the filters, decoders, features, and tweak-ability for advanced users was also superior. The other programs out there are good for getting started, but just don’t match what Studio1 has to offer. That being said, they may get there one day. Did you make sure that you used a calibrated signal source with all the software you did A-B tests with to make this kind of evaluation of the noise floor of Studio 1? I have used Studio 1, HDSDR, SDR Radio, the original Winrad, as well as some others, and I do not see the significant improvement that you are claiming here for Studio 1. Without knowing how you tested or what you tested against, your claim is suspect. I agree with most of the comments made. There is amost no reply on customers remarks and suggestions from the author. Also as customer we don’t know what is in the pipeline for future releases as there are still many essential items missing from the program such as memory channels and database implication to name just two. What we now as customers is that we have to pay again for a major update and since the release of the program the progress has been extremely slow and I mean extremely in the real sence of the word. You can take a look at the Studio 1 Yahoo group to understand what I’m trying to tell you. Every day there are more unsatisfied and angry customers who will not write on the Yahoo group or were banned from it and mail via regular e-mail if they are not have already abandonned the use of the program as some have done. Conclusion, don’t throw away your money, there are a number of good working programs that will fit the bill and have a listening author with an ear to customers and are evolving their program in deliberation whith there users on a daily bases and always with a friendly note. Mark Bonham (or Jonas Husted)? What a fantasy for fake names… Please stop, you are ridiculous. If you are a real customer write an email to the support including your dongle number. Sandro, how about we let the readers decide who is living in fantasy land or not. As long as you see your customers as problems and treat them with disrespect, you will continue to drive away new customers. My advice to you is to find someone else who can interface with customers respectfully so you don’t have to and that you stay in the background making code, or you just throw in the towel right now. Anyone with half a brain can go to your Yahoo groups and verify what we are saying here. Why haven’t you done an in depth review of HDSDR or SDR Radio, or the many other programs out there that are FREE? You can’t use the excuse that you can’t get the manufacturer/author to send you a copy for evaluation. Excellent review for an excellent program. As a user I can confirm most of it and I am delighted to read some new things about future development I wasn’t yet aware of. – Demo version planned for Q1/2013. I have also been critical about Studio 1 not being a complete product from its debute, but I am pleasantly surprised and anxiously waiting for the updates mentioned in the review. As I can not find any other source of information I assume the reviewer was informed about these updates directly by SDR Applications. This must be great news for any Studio 1 customer. Paul, please be honest and comment about how Sandro treats people on the Yahoo group. I have seen many of your posts there and I know that you have witnessed the contemptuous way Sandro responds to criticism from customers. But it makes no sense arguing about it till the end of times. Sandro has put much solo work into Studio 1, and we all have our weak spots. Being criticized is much different from his side of the table. The list of updates for the coming months looks promising, so I decided to re-join the Yahoo group. I hope Sandro will coöperate with the group in developments and just ignore negative posts as he pleases. The more you try to suppress criticizm, the more it will rear its ugly head. Just join the group and give polite,constructive and factual input. When exactly can these updates be expected, it seems development is very slow..
Its a lot of money for what it is, drop the price by half to get SDR operators to take a look. Watch out Derek, next Sandro will be claiming that you are me too! He just cannot accept criticism without treating his customers like dirt. The issue I had with Studio 1 is just what you have described – the future planned features are pretty much what other free SDR software already provides. For example, HDSDR already works well with CAT using Omnirig. Customers, after having paid a lot for Studio 1, find out that there are many bugs, half implemented features, and many promises that are very slow to come, if they come at all. Derek, as you are a Studio 1 group member why don’t you post your questions there? Well, we are more interested in the quality of the features instead of the quantity; maybe we are “slow” but our features works well maybe because they are carefully developed and tested and not rushed out just to make someone happy. Studio 1 is for people interested in getting the best in terms of performances and reliability. Nobody is forcing you to buy Studio 1: I you will do it I will be glad. In the meantime your criticism is a bit pointless. I had some problems with S1 in the beginning but I have to say that Sandro was very helpful and patience on both of our parts paid off. Without being too technical (I’m not a techy) I can tell you that the S1 software is better (imho) than the native Perseus software as well as WRplus, Winrad, etc. I do think that SDR-Radio projects to be a exciting prospect with the Perseus but S1 is all I use now with my Perseus. For me the SAM function and on FM the SNR is a huge plus. I use Studio1 with an IC-R75 (mixer / sound card). Decoding in the S-AM mode is significantly better than in HDSDR. HDSDR is a great program with lots of features, but the SYNCH-behavior in ECSS mode is not especially outstanding. To use the full capabilities of Studio1 – you should have some IT experience and complete the missing features by third-party programs. Frequency tuning, managing favorites + tuning from a database I handle with HAMRADIO DELUXE. Audio recording directly into MP3 I make with mp3DirectCut. Compared with a dozen other SDR-programs Studio1 decoded best. Quality of decoding is (for me) about anything! I will buy it if it get a lot cheaper, otherwise ill stay with HDSDR and SDR#. 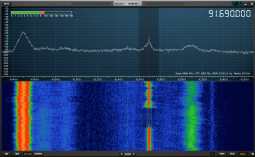 I use HDSDR for HF and SDR# for scanning VHF/UHF with a plugin. I have used practically every SDR software package past and present that will run with with my SDR-IQ. I am also a Flex Radio user. And there is absolutely no doubt in my my mind that Studio 1 is head and shoulders above the rest in terms of sheer performance and technical elegance. The Ferrari of SDR software. Keep up the good work Sandro. Have you tested the DSP performance numbers or they are simply taken at face value from the Studio1 site? The DSP numbers were provided from Studio1. Unfortunately we don’t have the means to provide accurate testing of these types of specifications at this time. Wow, quite a heated discussion here. I have not used S1, I have used most if not all of the free SDR control programs out there and I still come back to SDR# and SDR-Radio. There are now extra plugins for SDR# which add scanning and it supports the RTL / E4000 dongles. SDR-Radio I have used with my Fun Cube Dongle and it works very well. SDR# works well on low spec computers too, HDSDR WINRAD etc require much greater processing power from your PC , not having tried S1 yet I suspect it also requires a fast PC. For S1 not to have memory features yet seem very lame, sorry!! …not having tried S1 yet I suspect it also requires a fast PC. No it doesn’t: actually Studio 1 uses less CPU resources than all the above mentioned SDR programs (and others). This is quite evident especially in SWFM and WFM modes (Stereo Wide FM) when the DSP is heavier due to the high internal SR. Studio 1 uses the best (commercial) DSP library available and some parts of the program are written in Assembler for best optimization. Also Studio 1 is currently the only SDR program among ALL (including commercial ones bundled with receivers) that features SNR (Stereo Noise Reduction), a proprietary noise reduction algorithm developed by SDR Application (by me). About the (momentary) lack of memory banks inside Studio 1, please note that you can use many external programs (some free) for this purpose via CAT. Still no sign of a demo version? There is no way in this world I would fork out that kind of money on software like this that I cannot try before I buy, especially with the amount of negative comment with regard to the software author’s apparent attitude towards some users that I have read. Shame, because it sounds a lot like it might do what I want it to, but without being able to try it, I will never find out. Also no sign of the updates mentioned in the review. “The upcoming months” seemed to mean “any month after the day of publishing”. This can be freely interpreted as any day between here and eternity. I’m about to (try to) sell my dongle. I luckily didn’t sell my license, as extensive station memories have just been added to the program. It is a very worthwhile addition, taking the software to a next level. MFM and WFM modes are not supported in these memories. Rest of the updates in the review are still on the waiting list for the upcoming months. Assuming SDR RADIO v2 is FREE and performing extremly well, why should I pay about 150 euros for hypothetical slight improvment ? Say, SDR console cost 1 euro. Is STUDIO 1 150 times better ? Best regards, and special thanks to Simon for his amazing job on a free software. All considered, yes it does; but given your lack of intelligence showed in the above statement, don’t buy it. You shouldn’t be able to understand it. This explains why so many people waste money. – Frequency manager >1st version,WFM not available in memories. – Client/server remote operation >Not mentioned anymore.Dropped??? I wonder if there are enpough emprovements worth the investment. A real emprovement can only be with a lower noise front end or better antenna. Thanks for the heads up–I will go the free route. I saw the amount of money he wants for that garbage. Its laughable. S1 can shove it. Despite all of the vitriol aimed at this software and its developer, I find it to be the best SDR software on the market. Yes, it is expensive, but I’m pleased with my purchase. I have offered a more detailed review on eHam and on my personal web site, ab4bj.com. For those of you who want a disclaimer, I was not offered a “review copy” of the software and paid my hard-earned US dollars to purchase my copy. Thanks to Ham Radio Science for their unbiased and fair reveiw. As it’s been a couple of years, have the initial issues with Studio1 been addressed? Thanks Peter. I’ve now tried the demo. I found several annoyances right from the off. Way too faffy. Two hands just to change notch filter location?? I still haven’t worked out how to change bandwidth with the mouse. I shouldn’t have to look it up. For free, I’d probably be happy enough, but I get better for free already. It’s pretty, but not at that, frankly ridiculous price. I have no issue paying for things when they feel right. This just doesn’t sit well at all. It definitely looks good but way too many loose ends for me, as well as long standing “promises” that never made it into the program after some 2 years. Some windows are even still the same as in Winrad and don‘t match fhe layout. Can’t increase the waterfall, without increasing the wave display also. Windows that don’t resize. “holes” in the display with fixed sized windows. Sudden freezing of the waterfall when changing rate. Simply trying to adjust volume or squelch ended up with the window being dragged around the screen. And dongles? Who uses them nowadays? Tiny little buttons to zoom the demod display. Faffy adjustment for notch, bandwidth. Apparent non-interactive displays. By the time you’ve spotted some transient and tried to tune it, it’s just a memory on the waterfall. I could go on, but I won’t. I suspect that the dev has lost interest in Studio1. I know that I have. No wonder he was resistant to providing a demo. While I usually don’t reply to anonymous (not anymore), this time I feel the necessity to reply to “Ball” for the benefit of other “bona fide” readers. Ball – (ancient Latin were right, nomen omen), your comedy would have held well save for a fatal error: you stated “Sudden freezing of the waterfall when changing rate“, too bad that the demo version of Studio 1 is not capable of doing this! Only the regular version can change the input sample rate on the fly (causing a brief freezing while the hardware is reloading the FPGA), the demo has a fixed 1MS sample rate (from the demo files). To make a long story short, Ball is a Studio 1 owner and probably someone we have already seen here with another fantasy name. I think there is nothing to add, I find all this astonishing! Whatever happened to the impressive list of updates mentioned in the review over one-and-a-half years ago? I could not find these features in the demo, but have they meanwhile found their way into the actual program? Unfortunately Sandro’s detective work is as flawed as his presumptions. For a moment there I was happy to see that the dev had chosen to reply to me personally, in what I thought, was to be a detailed reply to my points of order. What I had not expected, was that the business owner would attempt to troll me with sarcasm and falsities. In the DEMO version, within ‘Main SP – SETT – Main Spectrum Settings’ there is a setting ‘Refresh Rate”. There is also a “T x100” option, which also varies the rate that the waterfall progresses. They are there, even if you pretend otherwise. Maybe, rather than mocking yourself further by attempting to belittle and marginalize a potential buyer, notably by claiming that I am some or all of the people who have critisized your expensive application (based it appears, on someone elses freeware) maybe you could reply to ALL of my comments about the program. No answer, so I can only assume in 1 and 3/4 years almost none of the updates mentioned in the review have actually been realized. It seems to me it would be a good moment to revise the review for the “bona fide” reader into a more honest representation. It’s shame that the developer only seems to show up to troll. I was rather hoping for a considerably more intelligent response than the one that I have received, and no improvement on that appears to have been offered since. I have bought a great deal of SDR related hardware and paid software when it’s attracted my attention. However, it goes without saying that I won’t be adding to my current suite by buying from such an evidently arrogant company owner. When I re-read some of the vitriol that the actual company owner, on this very thread, has strewn at those critical, I’m amazed that he’s able to offload his products to anyone. I’m grateful to the admin of HamRadioScience for allowing both sides of this to be left on here. The Studio1 owner’s own Yahoo Group seems somewhat one-sided and clearly less representative of who have shown an interest. Wow! I was getting ready to buy Studio 1. But I do not like the way the author is handling the situation. This is part of doing business in the modern world. You will have to learn to cope with it, or have your business hurt by the poor behavior. Passionate or not, mean and vindictive is no way to run a business over the internet. I guess I’ll put more time into helping the authors of the applications I do like improve their offerings. Is there any news on the new features announced in the 2013 review? It is now Nov. 2015. Curious – What is going on with Studio1? How is the “to-do” list coming along? Website says copyright 2012/2014 and we are entering 2016. Are they still in business and developing? It’s possible to use Studio 1 with first IF from rig ? Today i use HDSDR with Afredi USB and icom 7410 rig .